Established in 1968, the Department of Geography Map Library is the largest collection of cartographic material in Saskatchewan. A comprehensive collection of maps, atlases, cartobibliographies, periodicals, air photos, and other reference materials is maintained. The Map Library is extensively used for research, seminars, and teaching purposes by the faculty, students and researchers from various departments of the University. As the centre for cartographic information, it also provides reference and consultation services to other educational institutions, government departments, business community, and the public in general. human and economic maps showing population, land use, agriculture, minerals, industry, trade, transportation, urban analysis, etc. The collection provides comprehensive coverage of Saskatchewan and is augmented with national and international sets both in bound and unbound formats. Specialized and rare maps, atlases, gazetteers, and other reference materials are available. Reference and consultation services are provided. Faculty and staff of the University may borrow maps. Students and off-campus users require permission from the department cartographer, Mark Cote or the Department Head. Generally open 1 week after the start of each semester (usually Fall and Winter, occasionally Spring/Summer), closed all university holidays including dates allotted for final exams at the end of each semester. 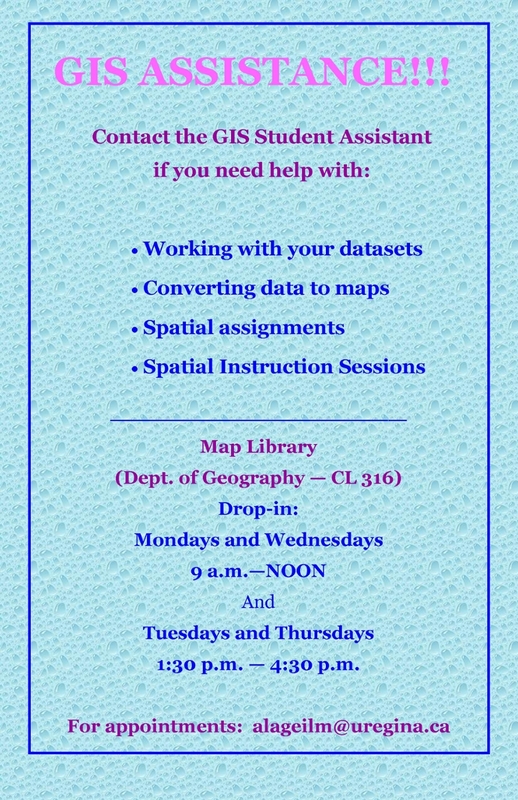 For hours of operation each semester, please contact the Department of Geography.